When free markets and democracy get skewed by the power and influence of large business, we get the bastardized version of capitalism called corporatism. And when corporatism is allowed to run amok, the top 1% of 1% of the people consistently get richer and more powerful while everyone else systematically grows poorer. Case and point, Hong Kong. Touted as one of the world’s freest markets, it is producing a record number of new millionaires. The formation of these newly rich comes at a heavy toll: the bulk of the Hong Kong people facing a 30 year high for income inequality. Given that the corporate stranglehold over their government is set to tighten, they have little hope to reform their state using existing political channels. Any politician that rises to power will already be part of the corrupt game, and any real revolutionary figure would be weeded out well before taking a seat in office. This leaves few options. 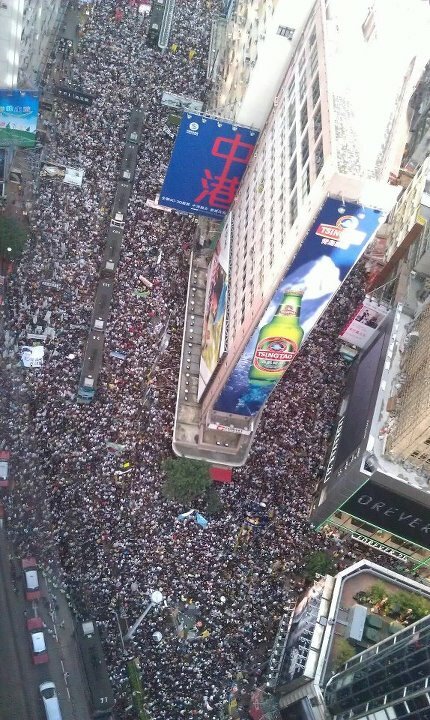 One thing the people of Hong Kong could do is unite. By taking the streets, coordinating and mobilizing online, they could forge an entirely new democratic mechanism and channel the warranted angst from the vast majority of the people into tangible political clout. Only then will their voice be heard, and only then will they get the reform they desire. What the Hong Kong people are going through serves as a microcosm for what the bulk of humanity is experiencing. Right now, powerful forces are subtley yet steadily stripping power away from the entire human race in order to widen their already mind-numbingly fat coffers. For years now, every single one of us has been under threat of an impending corporatist plutocracy. Only with unity and solidarity will we have any hope to overthrow our billionaire overlords and their minions. Fortunately, this is already happening. The world’s people are waking up. Slowly but surely, our global eyes are opening, allowing us to see ourselves for the first time. And one thing we will quickly learn is just how powerful we can be when we work together. After that, it’s just a matter of steering our species towards a more just civilization for all. Montreal’s Ethan Cox posted a passionate polemic pleading for Canadians to join in the people’s movement, to stand up against a broken government, and to help reclaim our declining democracy. But the engaged writer doesn’t stop there. Awesome, inspiring stuff! These words aren’t just for Quebeckers or Canadians alone. The message is for oppressed humans everywhere on earth. Don’t settle for corrupt government. Don’t accept the gross injustices of the system. Rise up alongside your fellow global citizens, and together we will co-create a brighter future for all. If you caught yesterday’s post listing a few reasons as to why the world ought to watch Montreal and Quebec, you may have noticed that I missed what is perhaps the most fascinating aspect of all: the median age of those who started this movement is about 21 years old. While the crisis in Quebec is not the first youth movement in history, it’s the first time I’ve seen one this close to home. I don’t remember my generation making anywhere near an impact when we were that age. It’s not that we weren’t equally motivated. It’s that technologies that exist today for the masses weren’t around 10 years ago. Now, the younger generations – those who’ve been immersed in the Net and social media for most of their lives – are showing the rest of us how to truly harness the real power we’ve been unleashing. With an even more immersed and interconnected generations on the horizon, along with the proliferation of these new tools to even the oldest generations, uprisings like those in Montreal and on Wall Street are sure to be dwarfed by the revolutions yet to come. It may have been the largest display of civil disobedience in Canadian history. Several hundred thousand people took to the streets, showing solidarity with Quebec’s youth movement while standing against Jean Charest’s draconian anti-protest laws. Awesome stuff! During the massive Occupy rallies in New York and Oakland, I recall lamenting about Canada’s lack of similar demonstrations. Well, no longer. Canadians will not be excluded from this great awakening taking place all over the world. It’s not just about tuition hikes and the Charter of Rights. There is something much more fundamental at stake. It’s the world’s people coming together to stamp out the inherent injustice and inequalities of a flawed global establishment. Expect to see more protests, more rallies, and more outpourings of dissent over the coming months and years. And as our numbers grow into the millions, the multi-millions and even billions, no one – no business, no government, no empire – will stop us from creating the just civilization we now know is possible. Watch out, Quebeckers, North Korea is coming. And its name is emergency Bill 78. Penned during an all-night session by Premier Jean Charest’s government, this bill sets strict limits on public demonstrations and threatens stiff penalties to anyone trying to exercise their right to gather in protest and exercise free speech. The precedent set here isn’t just bad for Quebec, it’s bad for our entire country. If they can do it there, why not everywhere? So a handful of individuals seize the protests as opportunity to resort to vandalism and violence and the entire movement gets punished. How typical! No wonder police go undercover to disturb the peace… it so readily negates populist uprisings. Which is really too bad, because I love what the students have been doing. I love their energy, their spirit, and their tenacity in the face of a domineering establishment. And really, their cause is just. Sure, they already pay the lowest tuition in all of Canada, and the hikes are relatively small. But that’s no reason not to expect better. Dark days happened in 2010 as security forces caused the largest mass arrests in Canadian history. Now, a new report confirms what many already knew – during the G20 summit police violated civil rights, detained people illegally, and used excessive force. The report also lambasted the unprecedented use of ‘kettling’, where protesters are corralled by riot squads into closed off areas to be detained and arrested. It is during kettling, where protesters are backed into a corner, where clashes can reach a boiling point and fatalities can occur. So police were overbearing and essentially silenced attempts at peaceful protest. But what else is there to expect when the government spends 664 million on security? Had nothing happened, the price tag might have seem unjustified. Still, what is most damning about this entire report is the utter lack of accountability. The authors of the report seem appeased to know their recommendations might be considered by police departments in the future. But this does little to protect Canadian free speech. How about some firings or fines or something to teach the police a lesson? If anything, the lack of repercussions will just encourage more of the same in the future. What would be nice to see is a clear message sent to police departments across the nation: do not stifle dissent, do not crush protests, do not silence free speech, do not impede peaceful assembly. Otherwise you will face stiff consequences. Until that happens, ham-handed security will be free to trample our rights the next time we unite against the injustices of the system. Update – May 17, 2012 Senior Toronto police commanders are expected to be charged in coming weeks for a variety of misconduct offences over their leadership at the G20 summit in June 2010, according to reports from the CBC. Awesome! This is more than just a slap on the wrist, or at least it could be.